The Secret of well-being lies within…. Press the button on the top of the locket to release the cover, and reveal the first of many secrets…an exquisitely detailed heart, the symbol of love! Immediately, wonderful aromatic vapors rise up to meet you and begin to deliver their therapeutic benefits. Open the heart grille and discover the secret compartment that holds your aromatic oils. Simply place a fresh wick inside and add a few drops of the oil that you choose. Breathe deeply and discover within yourself, the physical, emotional and spiritual harmony that is the ultimate secret of your well being. 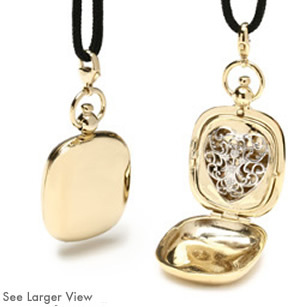 Remember this secret by engraving “The Secret of Well-Being Lies Within” on the locket cover. or make this piece a personal treasure with a monogram of your initials. Initials will be engraved FIRST- LAST- AND MIDDLE name with the last name being the largest initial in the middle. Please put your last name in the middle position. For two initials, indicate "none" in the middle box. For one initial, indicate "none" in the last 2 boxes.